The challenge is still going strong! Day two: Apple Crumble Pie. If you like apples, raisins, cinnamon, pie or crisp (or both, in this case) then this is the desert for you. 1. Preheat oven to 375 degrees. Make crumb topping: In a medium bowl, combine 1 cup flour, 6 tbsp butter, 1/4 cup brown sugar, and 1/4 teaspoon salt. Work with fingers until large clumps form; freeze. 2. On a lightly floured piece of wax paper or parchment paper, roll dough into a 14-inch circle. Carefully fit into a 9-inch deep-dish pie plate, gently lowering dough into bottom and sides of pie plate without stretching (you will have a 2-inch overhang all around). Refrigerate. 3. Place 2 tbsp lemon juice in a large bowl. Peel, core, and slice 8-10 apples 1/8 inch thick, transferring them to the bowl as you work. Add 1 cup granulated sugar, 1 cup raisins, 1 tsp cinnamon, 1/4 cup flour, and 1/2 teaspoon salt; toss to combine. Transfer apple mixture to pie crust, pressing in firmly. Fold dough overhang over filling, pleating it as you work your way around pie; press dough firmly against filling. 4. 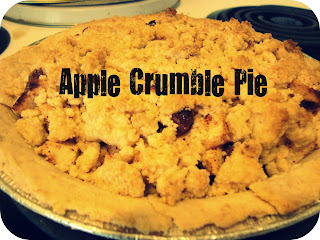 Bake 45 minutes, then sprinkle apple filling with crumb topping. Continue to bake until golden and bubbling, 30 to 45 minutes more. Cool at least 6 hours before serving. Then enjoy a delicious apple pie and apple crisp all in one!